Last year at this time I was dreading setting up for Christmas because I was hugely pregnant with twins and starting to reach the “get these babies out of me” stage of the pregnancy. But I did it. I didn’t like it, but I did it. This year, with babies who may not yet know the magic of Christmas, but who most certainly will, and being in our new (hopefully forever) home, I’m waaaaaaay in the spirit. The halls are being decked and the twinkly lights are being set up in as many places as possible around the house. I would be the world’s biggest liar if I said I didn’t like this. And while I have kids young enough to let me get away with whatever decor I want, I went for a very subtle and textured vibe. Lots of white, greens and warm metallics. And if you know me, you know this suits my general decor very well! I made simple white cutouts of olive leaves. And truthfully? I love them! I used them as fillers in the garland on our stairwell and I also used them on the Christmas tree as a garland itself. I’ll show you how. I had the help of my super handy Cricut Explore One machine for this project, so if you don’t have one, don’t worry – you’ll have a chance to win one at the bottom of this post. I designed the graphic in photoshop, uploaded to the Cricut Design Space and got to cutting. Honestly, once the designing part was done (which wasn’t easy for me), the rest was an absolute breeze! And the good news for you is that if you want to make this, you can use my design and save yourself my headaches! Once I had them all cut out I sorted by size. I had every intention of hanging them and bunching some of them together to make mistletoe-type ornaments, but that just never happened. I ended up liking them so much more as just simple standalone leaves to fill in the tree and garland. Speaking of the garland…all of the leaves have little slits at the very top, which makes garland prep super easy! The leaves just literally fit into one another. I kind of wanted to hang this garland everywhere, and may just make one for the mantel still. We’ll see! Once it’s together and the length you need, just hang ‘er up! Seriously, you guys, I told you this was super simple. I wasn’t lying. I put my garland in between the faux-fur one that was already on the tree and I love all the mixes of texture and shades of white. This tree may be my favourite one yet. As for the garland, I used string (and then got smart and used wire) to attach them to parts of the garland along with some magnolia leaves. Again, it doesn’t get much simpler. And, if I decide to use these leaves for more projects, I can still make a little mistletoe-like ornament with them. I didn’t actually use the metallic leaves I cut out, so I do have extras. I just really liked the simplicity of the white. Call me boring, but sometimes white is just the best option! If you’d like to make your own, here’s the graphic with the olive leaves! Now, remember how I said that you could win your own Cricut? Well…. I would actually cut out a TON of decor for my upcoming wedding if I had a cricut! I would make ALL the things. No but seriously. I would make all sort of crafts – like laser cut toppers… Christmas ornaments. Cards. I have the original cricut and love it but I’m amazed at how much more the new ones do! This is such a unique and clever idea! I love this!! It’s gorgeous. This garland is beautiful! Your tree and christmas decor is stunning. This looks amazing! I’m really loving what you’ve done with the tree, so pretty. There are so many things I can think of that I could make…cards, art work, I saw a paper cut out luminary that was beautiful! These turned out great, love the simplicity, the white and the texture they add. So pretty. 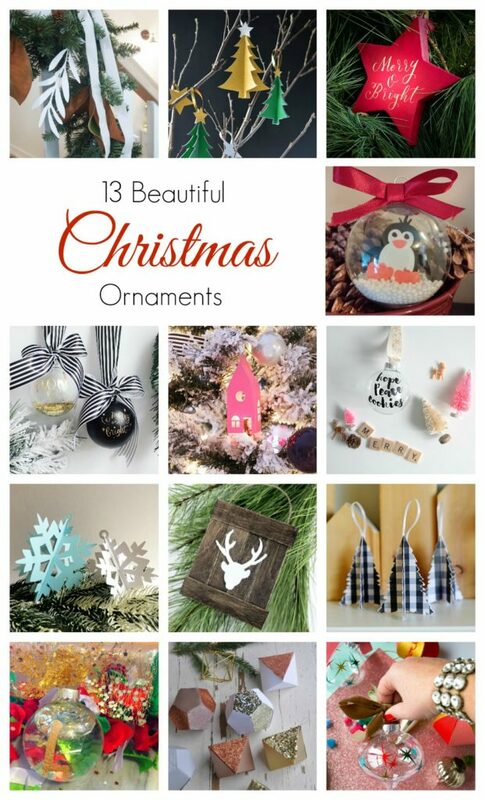 I would love to make some of those gorgeous ornament and to decorate our babys nursery! Oh that sounds lovely! Good luck! Beautiful garland! Very you! I should try something like this with all kinds of colours! Thanks! And that would definitely put an Ariel spin on it! I love it. Wow!! I would love to win this! As a mommy to a little boy, I could use it throughout his childhood! Oh definitely! So many fun things to make. Good luck! I’ve been wanting a Cricut for years, but between ongoing renos and related DIY projects, crafts has taken a back-seat. But now we’ve moved from the DIY house and so I would LOVE to win and get to set it up in my new craft room (aka spare bedroom). and… just realized I didn’t answer the question! I would lvoe to get back into card making. People just love getting a handmade card! Oh that’s so true! The Cricut is so great for making cards! I’d like to make baby room decor for my friend’s grandchild that’s on the way. That sounds lovely! Good luck!! Beautifup idea! I’d love to make some detailed stencils for some projects!! Oh, my! This would so great for my mixed media. Plus a million other projects!